The haemostatic system (described in previous sections) is always in a delicate balance between unstopped bleeding and thrombosis. The balance can however be disrupted by, for example, a state of disease or when blood comes into contact with the surface of a foreign material. In modern health care, treatment- and diagnostic methods often implicate the contact between blood and artificial materials (biomaterial). Treatments including venous catheters, stents, vena cava filters, vascular grafts and prosthetic heart valves are a few examples of biomaterials that are introduced into the vascular system and brought into contact with blood. This contact between blood and biomaterial is also constantly present during procedures when blood is handled outside the body, e.g. during cardiopulmonary bypass, in dialysis machines, during blood transfusions or simply, when blood is drawn by venipuncture and used for in vitro experiments. The artificial material surface may activate both blood cells (platelets and white blood cells) and the enzyme mediated coagulation cascade by exposing a surface that during blood contact shares certain characteristics with surfaces found at the site of vascular injury. This may ultimately lead to unwanted thrombus formation at the artificial surface (for example see Figure 1), a serious adverse effect that is usually prevented by aggressive antiplatelet and/or anticoagulation therapy. Three examples of such therapies are: high doses intravenous heparin during cardiac surgery with cardiopulmonary bypass , dual antiplatelet therapy after implantation of metal stents in the coronary vessels , and continous warfarin treatment of patients with prosthetic heart valves. The extent to which artificial materials affect and provoke the haemostatic mechanisms is heavily dependent on the design and characteristics of the biomaterial, but also where in the vascular system it is implanted (for review see [4, 5]). Surfaces inert to platelet adhesion and activation of coagulation can be achieved through surface modifications. Immobilized heparin or poly(ethylene glycol) (PEG), are the most widely used surface modifications in this context [6, 7]. on a hydrophilic glass surface. Black arrows indicate single platelets and the white arrow indicate a red blood cell. The duration of the experiment was 8 minutes. Images were acquired by differential interference contrast (DIC) microscopy. 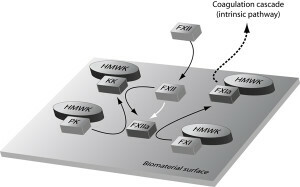 Although the physiological role of factor XII in haemostasis is debated, as congenital factor XII deficiency does not result in any type of bleeding diathesis [25, 26], it is however clear that factor XII has a great impact on coagulation during the contact between blood and artificial materials. Factor XII activation has for a long time been thought to exclusively undergo autoactivation on surfaces exposing a negative net charge (anionic surfaces). However, after the recent work of Zhuo et al. [27, 28] it is evident that autoactivation also can occur on hydrophobic surfaces, but only in neat factor XII buffer solutions. It has been hypothesized that factor XII in plasma is competitively excluded from hydrophobic surfaces by other proteins with higher affinity to the surface, a process that has been named “adsorption-dilution effect” . Although this was an interesting discovery, it has no real impact on blood compatibility testing of biomaterials under physiological conditions. Blood contact will always entail competitive adsorption between the many plasma proteins, and contact activation of factor XII in plasma will therefore only occur at negatively charged hydrophilic surfaces. The underlying mechanism facilitating the conversion of the inactive zymogen factor XII to the active enzyme factor XIIa on anionic surfaces, independent on other enzymatic activity, is still not very well understood, but it is suggested to be facilitated by conformational changes in the protein structure upon surface adsorption [30, 31]. After initiation by factor XII the contact activation is effectively amplified by the presence of prekallikrein and HMWK. Prekallikrein is located at the anionic surface when bound to its surface binding cofactor HMWK. The co-localization of prekallikrein with factor XIIa on the surface facilitates the cleavage of prekallikrein to kallikrein, which then can participate in reciprocal activation of factor XII. The intrinsic pathway is from factor XII propagated downstream by activation of factor XI, which also is colocalized to the surface by HMWK (reviewed in ). The mechanisms of contact activation are presented in Figure 3. Contact activation in plasma by a hydrophilic glass surface will lead to fibrin formation in a matter of minutes. Figure 3. The initiation of the intrinsic pathway through autoactivation of factor XII (contact activation) at a biomaterial surface. for kallikrein and factor XI by facilitating the binding to surfaces. White arrow indicates autoactivation of factor XII (FXII). Although not the core of this work, it is important to mention biomaterial surface susceptibility to humoral immune complement proteins. According to theory, nucleophilic surfaces, exposing –NH2 (amino groups) or –OH (hydroxyl groups), but not negatively charged surfaces bind complement factor 3b (C3b). C3b in turn binds factors Bb and P forming an active alternative convertase C3bBbP, that subsequently cleaves C3 in solution to C3a and C3b . An amplification mechanism is thereby formed. The surface binding of C3b was recently shown to also be mediated by pre-adsorbed proteins . In yet another study, it was shown that negatively charged surfaces, such as silica and spontaneously oxidized titanium facilitate C3b deposition , leading to the hypothesis that complement binds to denatured proteins on surfaces regardless of surface charge. The alternative complement activation pathway is considered to be of greatest importance, and especially in blood contacting applications where a large area of the biomaterial is in contact with blood, such as cardiopulmonary bypass and dialysis apparatus . 1. Koster A, Fischer T, Praus M, Haberzettl H, Kuebler WM, Hetzer R, and Kuppe H. Hemostatic Activation and Inflammatory Response during Cardiopulmonary Bypass: Impact of Heparin Management. Anesthesiology, 2002; 97(4): 837-841. 2. Marc C. Antiplatelet therapy in percutaneous coronary intervention: A critical review of the 2007 AHA/ACC/SCAI guidelines and beyond. Catheterization and Cardiovascular Interventions, 2009; 9999(999A): NA. 3. Pibarot PDVM and Dumesnil JGMD. Prosthetic Heart Valves: Selection of the Optimal Prosthesis and Long-Term Management. Circulation, 2009; 119(7): 1034-1048. 4. Gorbet MB and Sefton MVMV. Biomaterial-associated thrombosis: roles of coagulation factors, complement, platelets and leukocytes. Biomaterials, 2004; 25(26): 5681-5703. 5. Ratner BD. Blood compatibility – a perspective. Journal of Biomaterials Science, Polymer Edition, 2000; 11: 1107-1119. 6. Andersson M, Andersson J, Sellborn A, Berglin M, Nilsson B, and Elwing H. Quartz crystal microbalance-with dissipation monitoring (QCM-D) for real time measurements of blood coagulation density and immune complement activation on artificial surfaces. Biosens Bioelectron, 2005; 21(1): 79-86. 7. Hansson KM, Tosatti S, Isaksson J, Wetterö J, Textor M, Lindahl TL, and Tengvall P. Whole blood coagulation on protein adsorption-resistant PEG and peptide functionalised PEG-coated titanium surfaces. Biomaterials, 2005; 26(8): 861-872. 8. Nygren H. Initial reactions of whole blood with hydrophilic and hydrophobic titanium surfaces. Colloids and Surfaces B: Biointerfaces, 1996; 6(4-5): 329-333. 9. Nygren H, Tengvall P, and Lundström I. The initial reactions of TiO2 with blood. Journal of Biomedical Materials Research, 1997; 34(4): 487-492. 10. Anderson NL and Anderson NG. The Human Plasma Proteome: History, Character, and Diagnostic Prospects. Mol Cell Proteomics, 2002; 1(11): 845-867. 11. Haynes CA and Norde W. Globular proteins at solid/liquid interfaces. Colloids and Surfaces B: Biointerfaces, 1994; 2(6): 517-566. 12. Tengvall P, Lundstrom I, and Liedberg B. Protein adsorption studies on model organic surfaces: an ellipsometric and infrared spectroscopic approach. Biomaterials, 1998; 19(4-5): 407-22. 13. Wilson CJ, Clegg RE, Leavesley DI, and Pearcy MJ. Mediation of biomaterial-cell interactions by adsorbed proteins: a review. Tissue Eng, 2005; 11(1-2): 1-18. 14. Turbill P, Beugeling T, and Poot AA. Proteins involved in the Vroman effect during exposure of human blood plasma to glass and polyethylene. Biomaterials, 1996; 17(13): 1279-1287. 15. Vogler EA. Structure and reactivity of water at biomaterial surfaces. Advances in Colloid and Interface Science, 1998; 74(1-3): 69-117. 16. Ortega-Vinuesa JL, Tengvall P, Walivaara B, and Lundstrom I. Stagnant versus dynamic conditions: a comparative adsorption study of blood proteins. Biomaterials, 1998; 19(1-3): 251-62. 17. Tsai W-B, Grunkemeier JM, McFarland CD, and Horbett TA. Platelet adhesion to polystyrene-based surfaces preadsorbed with plasmas selectively depleted in fibrinogen, fibronectin, vitronectin, or von Willebrand’s factor. Journal of Biomedical Materials Research, 2002; 60(3): 348-359. 18. Tsai W-B, Grunkemeier JM, and Horbett TA. 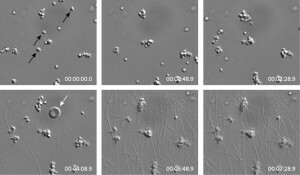 Human plasma fibrinogen adsorption and platelet adhesion to polystyrene. Journal of Biomedical Materials Research, 1999; 44(2): 130-139. 19. 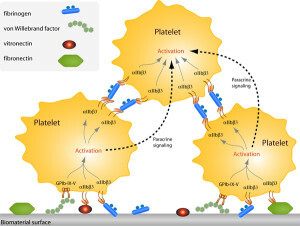 Wetterö J, Tengvall P, and Bengtsson T. Platelets stimulated by IgG-coated surfaces bind and activate neutrophils through a selectin-dependent pathway. Biomaterials, 2003; 24(9): 1559-1573. 20. Grunkemeier JM, Tsai WB, McFarland CD, and Horbett TA. The effect of adsorbed fibrinogen, fibronectin, von Willebrand factor and vitronectin on the procoagulant state of adherent platelets. Biomaterials, 2000; 21(22): 2243-52. 21. O’Toole TE, et al. Integrin cytoplasmic domains mediate inside-out signal transduction. J. Cell Biol., 1994; 124(6): 1047-1059. 22. Savage B and Ruggeri ZM. Selective recognition of adhesive sites in surface-bound fibrinogen by glycoprotein IIb-IIIa on nonactivated platelets. J. Biol. Chem., 1991; 266(17): 11227-11233. 23. Yayapour N and Nygren H. Interactions between whole blood and hydrophilic or hydrophobic glass surfaces: kinetics of cell adhesion. Colloids and Surfaces B: Biointerfaces, 1999; 15(2): 127-138. 24. Lee JH and Lee HB. Platelet adhesion onto wettability gradient surfaces in the absence and presence of plasma proteins. J Biomed Mater Res, 1998; 41(2): 304-11. 25. Mann KG. Biochemistry and physiology of blood coagulation. Thromb Haemost, 1999; 82(2): 165-74. 26. Ratnoff OD and Colopy JE. A familial hemorrhagic trait associated with a deficiency of a clot-promoting fraction of plasma. J Clin Invest, 1955; 34(4): 602-13. 27. Zhuo R, Siedlecki CA, and Vogler EA. Autoactivation of blood factor XII at hydrophilic and hydrophobic surfaces. Biomaterials, 2006; 27(24): 4325-4332. 28. Zhuo R, Siedlecki CA, and Vogler EA. Competitive-protein adsorption in contact activation of blood factor XII. Biomaterials, 2007; 28(30): 4355-4369. 29. Vogler EA and Siedlecki CA. Contact activation of blood-plasma coagulation. Biomaterials, 2009; 30(10): 1857-69. 30. McMillin CR, Saito H, Ratnoff OD, and Walton AG. The secondary structure of human Hageman factor (factor XII) and its alteration by activating agents. J Clin Invest, 1974; 54(6): 1312-22. 31. Samuel M, Pixley RA, Villanueva MA, Colman RW, and Villanueva GB. Human factor XII (Hageman factor) autoactivation by dextran sulfate. Circular dichroism, fluorescence, and ultraviolet difference spectroscopic studies. J. Biol. Chem., 1992; 267(27): 19691-19697. 32. Colman RW. Surface-mediated defense reactions. The plasma contact activation system. J Clin Invest, 1984; 73(5): 1249-53. 33. Chenoweth DE. Complement activation in extracorporeal circuits. Ann N Y Acad Sci, 1987; 516: 306-13. 34. Wettero J, Askendal A, Bengtsson T, and Tengvall P. On the binding of complement to solid artificial surfaces in vitro. Biomaterials, 2002; 23(4): 981-91. 35. Arvidsson S, Askendal A, and Tengvall P. Blood plasma contact activation on silicon, titanium and aluminium. Biomaterials, 2007; 28(7): 1346-54.